R2014, Patrick O'Connor. 34”, L. Ruffled yellow near self. Falls very wide with light olive green veins at base and narrow olive green dagger signal on a small orange thumbprint. Flaring standards a slightly lighter yellow. Very overlapping flower form. 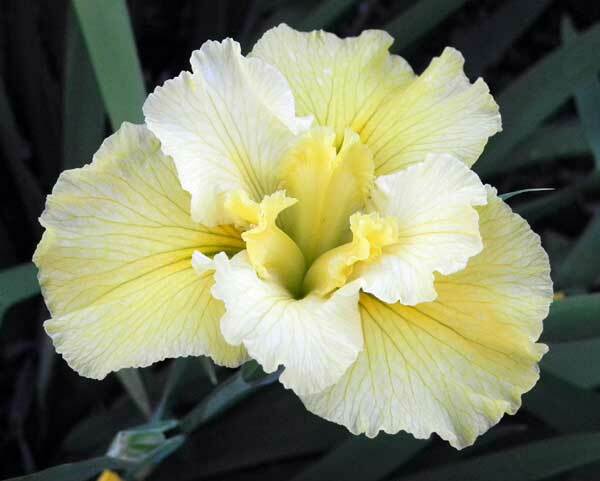 Wide, creamy yellow style arms somewhat frilly toward tips. Mothership X German Coast. 'Everything That Rises'" is named for the short story collection by Flannery O'Connor, Everything That Rises Must Converge.